Despite its title, the Ardrossan News actually contained mostly Port Wakefield news. Advertising itself as, "the only paper printed and published in Port Wakefield," it is difficult to know why the title did not reflect this fact. The newspaper appeared weekly for five months, from February to July 1911. The latest copy known is dated 7 July 1911 but contains no indication whether this is the final issue. Thomas Carrigan was the printer and publisher. 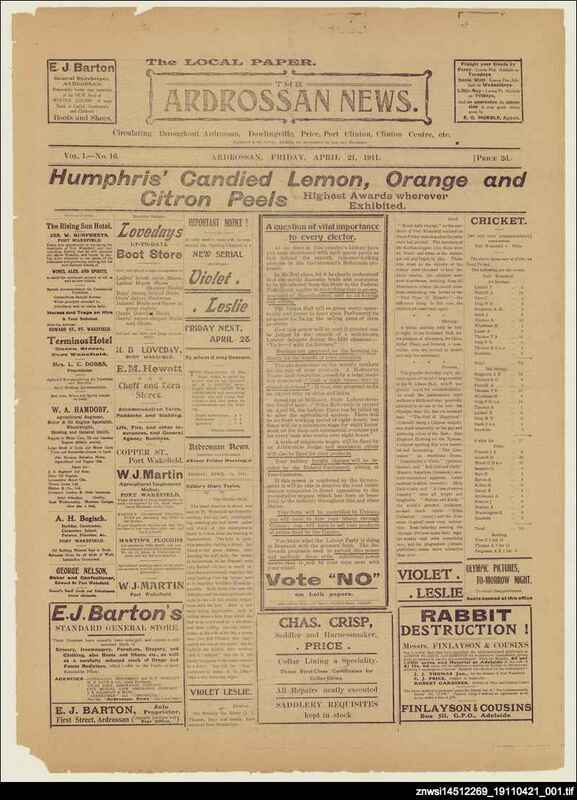 Using a syndicated double page of general interest articles and stories (probably produced in Melbourne), he simply added a front and back page of local news and advertisements. This was a common method for producing cheap newspapers at the time. Sport Cricket matches are reported in early issues. In May the opening of the Port Wakefield Golf Club is described. (12 May 1911, p. 4) Preliminary meetings of the Port Wakefield Football Club for the coming season are also reported. Politics The activities of the Port Wakefield branches of the Woman's Christian Temperance Union, and also the Liberal Union, are often reported. Geographic News from the towns of Ardrossan, Port Wakefield, Maitland, Price and Lochiel is most often covered. Occasional news items from Dowlingville and Port Clinton also appear.